It was an absolute pleasure working on this Argosy, transforming a bare shell into a chic container ready to house an artisan and her wares. After a few ferries we arrived in a quaint town tucked away in an island of trees and beautiful architecture. You could see form the moment we arrived this area loves all things vintage. Classics were parked around every corner, and we even spotted a woman taking a stroll on her mint green vintage bicycle. We were greeted with open arms, and were able to take our time setting things up and helping our client settle into the new space. Her belongings fit into the trailer as if they had been meant for it. Nothing is more pleasing than seeing something you have toiled away on for so long come to life in its new home. It was almost magical to see the helicopter leaves lazily shower down on the Airstream throughout the day as we darted in and out. As always, it felt weird to leave something you have grown so attached to behind, but we knew there could not be a better home for this gentle beast. With her tools and new inspiration in hand, we left Mimi ready to craft masterpieces in her "new" Argosy studio. We can't wait to see what she comes up with next! We were happy to see the hard work on the polishing paid off. The trees on this lot seem to frame the space for Gogo perfectly. The sun washed down on her for most of the day, shining brilliantly off the aluminum. 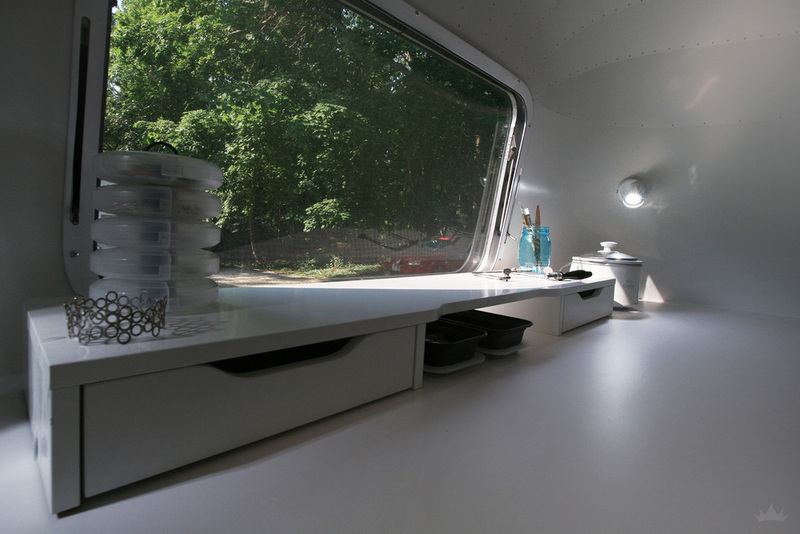 The greenery and natural patterns always look amazing splashed across an Airstream's shell. The steel end-caps came out great as well, using a gloss finish helps continue the same sheen and texture across the whole surface. By bringing that black down into the beltline, emblems, hitch, and bumper, interest was added to the look in a clean and striking way. New lights make a world of difference as well. It's like adding fresh paint to a room. We love how much the little details can transform a look. Using lighting we were able to really shape the interior into two distinct spaces. By using sconces, LED lit displays, and separating the puck lights into two sections the light focuses consumers toward the product. Our hand stained faux driftwood brought the beach feel to the design. The awesome boxes, organza mannequins and natural items like nests and driftwood are belongings of the client that completed the look to a T. To bring more nature in, we gave the front section a small planter box which adds color to the displays and creates the perfect finishing touch. This fun, modern take on the Hamptons should stand the test of time. With such an open layout, we had to fit storage wherever possible and tuck away things like the electrical panel and water heater. The client's existing Ikea units were worked into the design, along with open space under the desk area to stack bins and tupperware. The rounded corners were used to house technical appliances or more hidden storage. Overall we kept the interior as open as possible; providing clean back drops for displaying finished work and having photoshoots. The 360 studio space offers plenty of surface area to work on and covered storage to contain any madness the WIP stages bring. We are happy to report the client loved the outcome, and immediately began moving things into place! Not Goodbye, Just See Ya Later!